See our posts: Sleep Apnea: When Snoring Can Be Lethal and Sleep Apnea: Home Testing with WatchPAT Device and the Philips Respironics. On Livingwithatrialfibrillation.com, see Travis’ post: My In-Lab Sleep Study Experience. Travis Van Slooten: Now, I’ve mentioned in previous blog posts on my site and in previous podcasts, about the strong connection between sleep apnea and A-Fib. And, Steve, before we really dive into that topic specifically, and again, the connection between sleep apnea and A-Fib, I just want to take a step back, and first talk about sleep apnea in general, for those listening to this that aren’t familiar with it. Because I’m sure everyone’s heard of sleep apnea, but I think, at the end of the day, a lot of people don’t really know what it is. So, with that, Steve, let’s talk about, what is sleep apnea? Steve Ryan: Yeah, Travis, the technical name is obstructive sleep apnea. Now, what that means is, basically, somehow, the airways are being blocked, when you’re trying to sleep. Your sleep starts, and starts, and you gasp, and… The other one, which we’ll just mention, and then skip over, is central sleep apnea, where the brain is simply not sending signals, the proper signals, for the muscles to control breathing. That’s something we don’t get into very much. Usually, what we have to worry about is obstructive sleep apnea. Steve Ryan: Now, let me give you an example of what it’s like. My wife has sleep apnea, Patti. Travis Van Slooten: Oh, she does? Steve Ryan: Yes. Before she was treated, I’d be sleeping with her, and I’d listen, and she would actually stop breathing. I mean, actually stopped breathing for what seemed like a long time. Then, all of a sudden she’d gasp and start breathing again. And this would go on and on, and this would happen over and over again. And, obviously, she wasn’t sleeping well, and she’d be very sleepy the next day. And, of course, I wasn’t sleeping either, listening to this. But once she got a CPAP machine, which is simply a medical device, like a breathing apparatus that keeps the airways open, once she started using that, she sleeps like a baby now, and has no more problems. But that’s an example of how sleep apnea can affect you. It disrupts your breathing and your sleeping patterns. Steve Ryan: Oh, yes, she was. Travis Van Slooten: Oh, okay, she was snoring too. But the primary symptoms are snoring, and just, like you said, gasping for air. It’s very obvious, if you are sleeping with someone with sleep apnea, and you’re awake, and you witness it, right? It’s pretty obvious. Steve Ryan: Yes, yes. 43% of patients with A-Fib have sleep apnea. And I’ll tell you, let’s say you’re a guy, and you’re sleeping with your wife, and you get up in the morning, and you’ve got all these bruises on your side. That’s probably because your wife is elbowing you, trying to keep you from snoring. That’s a pretty good sign that you have sleep apnea. Steve Ryan: And the good thing about sleep apnea is it’s easily fixed. There’s a number… You can have this mask or you can have these dental devices that can help keep those airways open. It’s relatively easy to fix. Thank God. Travis Van Slooten: Yeah, absolutely. And you mentioned that the connection, as perfect transition now, into the actual connection here between sleep apnea and A-Fib. Now, you said, what, 43% of people with A-Fib have some form of sleep apnea? Steve Ryan: Yeah. It’s so prevalent, that I went to a A-Fib center in Louisville, Kentucky, and I was talking with the doctors there. And then I noticed that when a patient comes in, and they have A-Fib, they send ’em down to the next door, and they get a sleep apnea study then and there. Steve Ryan: They are so attuned to everyone coming in with A-Fib. Most, well, many people who come in with A-Fib have sleep apnea, that they make it part of their center. They won’t treat a patient, unless they go to the center, and have a sleep apnea study done then and there. And a lot of centers will not do a catheter ablation on you, if you have sleep apnea that you don’t take care of. Why? Because it recurs. It tends to…you tend to have recurrence because you have the same condition that created the atrial fibrillation in the first place is still there. Because basically any time you’re gasping for breath like that, and any time you’re not breathing properly, that’s a tremendous strain on your heart, and on your lungs, and that irritates the pulmonary veins. And that’s what probably brought on the A-Fib in the first place, so you really need to take care… If you have sleep apnea, you really need to take care of it. Travis Van Slooten: So sleep apnea… Are you saying then, that sleep apnea can cause A-Fib? Steve Ryan: Yes. Yes, indeed. Steve Ryan: There’s been a study done, where they studied 1,000 patients, so seven different studies. And all these patients were treated with Continuous Positive Airway Pressure, that’s CPAP, which is a mask worn. And CPAP cut the risk of A-Fib episodes in half. Travis Van Slooten: Oh, wow. Unfortunately, once A-Fib starts, it’s usually pretty hard to stop without something more radical. But some people, just from eliminating A-Fib, are lucky enough that that also gets rid of their… Just by getting rid of their sleep apnea, they also get rid of their A-Fib. But don’t bank the farm on that. It’s something that could happen. And it does happen to some people, but more often than not, you need more radical treatments to get rid of the A-Fib. Travis Van Slooten: Absolutely. And so I think the key takeaway here, as far as this connection is, if you have A-Fib now, just because you’re a skinny guy or gal doesn’t mean you don’t have sleep apnea. And I made that assumption. I assumed, ’cause I’m not really skinny, and I’m not really obese, or anything either, I’m a normal, average guy weight-wise, but I was like, “There’s no way I have sleep apnea.” And my doctor told me that anybody can get sleep apnea. It’s not necessarily overweight people. Although, that is definitely one of the risk factors, but skinny people can get it as well, right? Travis Van Slooten: So, if you’re a skinny guy or gal, and you have A-Fib, don’t just assume, if you’re listening to this, that, “Oh, that’s not me. I can’t possibly have sleep apnea.” Yeah, you definitely could, especially if you have A-Fib. Steve Ryan: Yeah. We have a story on our website by Kevin Sullivan, age 46, and he describes what happened to him: “My A-Fib seemed to start at night, while I was sleeping. One night, when I woke up, my heart was racing and I felt sweaty. When I asked my doctor about it, he told me that it was unlikely, because I was not overweight and I did not feel tired during the day.” That’s him saying, that’s why he didn’t think he had sleep apnea. “But I went to a sleep lab anyway and it turned out I did have sleep apnea.” And that’s, unfortunately, what happens to a lot of people. Just because you’re thin doesn’t necessarily mean you may not have sleep apnea, or you may not snore, and you may still have sleep apnea. Travis Van Slooten: Or like you said, that this gentleman wasn’t tired either, which is another common symptom of sleep apnea. Okay, and it’s not common, is it, Steve, for A-Fib centers or clinics to automatically have A-Fib people have a sleep study? I mean, we’re not at that point yet, where it’s part of the protocol. Steve Ryan: We’re getting there, to the point, where most A-Fib centers now, will not even consider you for a catheter ablation, if you don’t have a sleep study, sleep apnea study. Why? Because A-Fib tends to recur after an ablation, if you still have sleep apnea. Yeah, a lot of centers still don’t have sleep apnea studies connected with them, but they all are referring people for sleep apnea studies to other centers. So it’s becoming much more… Doctors are much more aware of how important sleep apnea is in A-Fib… And they’re making sure that people get treated for it. Travis Van Slooten: So, if you have A-Fib, and your doctor hasn’t suggested or recommended a sleep study, are you saying it’s probably a good idea to demand one? Steve Ryan: Yes, indeed. And I know there’s an expense involved. If you go to the overnight sleep study, yeah, that’s… We’re talking $1,100 to $2,000. But they have home testing kits now, that do almost as well. For $200, you can get one of these home things and do a sleep study to, at least, get you in the right ball park, where people can figure out whether you actually have something that needs more work. Travis Van Slooten: Yeah. And with the sleep, or with the home sleep tests, or the in-home sleep tests, are those… And you may not know this, Steve, but are they as reliable as the in-lab sleep studies? He looked at me, and like I mentioned, I was not overweight. I don’t have a thick neck. These are common things that doctors look at, when they’re assessing if someone may have sleep apnea. So he said, “I don’t think you have sleep apnea. If you do, it’s probably a mild, maybe a moderate form of it.” So he said, “I wouldn’t recommend for you the in-home sleep study because there’s a chance it’ll say you have it, and then we have to do a in-lab to confirm it anyway.” So he said, “You might as well skip it and do the in-lab,” and that’s what I did. Do you know anything about this? Have you heard any other kinds of thoughts on the in-home versus the in-lab, or not? Steve Ryan: I haven’t read any definitive studies saying one is worse than the other or one doesn’t work. I know there’s a number of different devices out there. And let’s say you get a false positive, big deal, that means that you get it checked out more thoroughly from your doctor, or maybe from going for a home study test. Steve Ryan: That’s a good thing. There’s two that I know of. One is Itamar Medical’s WatchPAT, P-A-T. This looks like a watch you put on your wrist, and then there’s also something that goes over your index finger, to measure like pulse oximetry, and it detects sleep apnea by measuring volume changes in peripheral arteries. Now, you’re gonna say, “Well, is that the same thing?” No, it isn’t, but it’s an indication. Another one is the Philips Alice NightOne. And this also is FDA-cleared. You put a belt around your chest, and it has a nasal cannula that you put… It’s a two pronged thing that you put into your nose, and you put it in your nostrils. And you also have a pulse oximeter, which you wear on your finger. There’s many other different HSTs: ARES by Watermark, ResMed, and others. There’s a lot of different things, and the main thing is, $200, you can get a test. Heck, $200 is not that big a deal for most people to determine whether they have sleep apnea. Travis Van Slooten: Now, do you know what the…sorry, I don’t mean to interrupt you, but with these HSTs, again, we’re talking home sleep tests. Do you have to… You can’t just get those direct, right? Do you still need to get a prescription form? Do you know how it actually logistically works? Do you know? Steve Ryan: They have a doctor who specializes in this, Dr Joseph Krainin, and he founded singularsleep.com, and he’s like one of the experts on HST. And if you call him, or get in touch with him, I’m certain he can work out whatever you need, to get you hooked up to a HST. Travis Van Slooten: Oh, perfect. Travis Van Slooten: Yeah, and the only reason I bring it up, Steve, is just if someone’s listening to this, you may not… It might not be as easy as just going to their website and ordering the device. Travis Van Slooten: And I think you still need to get your doctor involved. But I think, again, this was a couple of years ago, when I was looking into it. I could’ve just called my family doctor and said to him, “Hey, I wanna do this home sleep test, but I need you to call it in.” So it’s not that big of a deal, but it isn’t… You don’t just… It’s not like buying something on Amazon.com. There’s some steps involved. Travis Van Slooten: Oh, absolutely. Steve Ryan: In spite of it. Travis Van Slooten: Yeah, which was the case for me, because I didn’t sleep very well, and I was actually surprised, because when he woke me up, I felt like I didn’t even really sleep. That was the first question I had to him was, “Did I sleep enough for you to get what you needed?” And he said, “Oh, yeah. Yup, we got what we needed.” So yeah, you’re right. The in-lab, it’s like NASA. They’ve got…the technology they have in these labs, they can pick up anything. And so, if you don’t mind going that route, and you have the money, it might be better just to skip the home test, and go right to the in-lab. But, yeah, if you’re tight on money, or you just don’t want to go through that complex of a situation, start with the home sleep test, for sure. Travis Van Slooten: Now, you had mentioned, Steve, earlier, there are some easy ways to treat apnea. What are some of the common treatments, again, for sleep apnea? Steve Ryan: Well, they have dental appliances that dentists can make for you, to make sure your airways stay open. I’m not saying that that’s gonna be…work for everybody. But it is an option, and it’s certainly a little bit less cumbersome than wearing a CPAP device. And also, there are various CPAP configurations. My wife uses a half one; it just goes over her nostrils. Some people use a full mask that goes over both the nose and the mouth. There’s lots of different variations, and most centers will work with you to find something that’s comfortable for you, that will help you sleep well without being bothered by it. Travis Van Slooten: If you have a really bad form of it, or you just can’t tolerate the CPAP machines, or the dental devices don’t work, surgery is an option, but again, based on my admittedly limited research on it, the success rates of that surgery aren’t that great. But that is also a possibility, because I also… I hear from a lot of people that have sleep apnea, and they just say, “I can’t do the CPAP machines.” And then, I’ll just mention to them, surgery is an option. It’s not something I probably would go for, but that is always an option as well. Steve Ryan: Yeah. It’s usually considered an option of last resort because they actually go in there, and cut out the muscle or tissue that is blocking the airway. Steve Ryan: And like you said, it’s major surgery. There’s no doubt about it, it’s major surgery. And it isn’t always as successful as they’d like it to be, but it is an option. Travis Van Slooten: Yup, yup. Now, and I think you touched on this as well, Steve, but can treating sleep apnea cure A-Fib? Steve Ryan: In some instances, some lucky people can get rid of their A-Fib and have no more… Can get rid of their sleep apnea and be cured of A-Fib. Steve Ryan: But those people are few and far between, unfortunately. But for some people, getting rid of sleep apnea does cure A-Fib. But, unfortunately, for most people, once A-Fib starts, it takes a more radical… Something more radical to get it cured. However, you still need to… Even after you’ve… Let’s say you’ve had a catheter ablation and your A-Fib is cured, you still can’t ignore sleep apnea. You still have to keep treating it, keep using the CPAP machine, or whatever device you use. Because if you don’t, that A-Fib can recur. Travis Van Slooten: Well, and not to mention, just the other health issues that might come, as a result of your untreated sleep apnea. Travis Van Slooten: Absolutely. Perfect. Any other wrapping thoughts here on this topic? Steve Ryan: No, I can’t think of anything. Thank you, Travis. Travis Van Slooten: Alright, Steve, as always, it’s a pleasure and thanks for joining me today. Steve Ryan: Glad to be here. Most people who’ve had a successful catheter ablation can tell you how wonderful it feels to have a heart that beats normally again. Thanks to Dr. Marrouche and his colleagues, we now have hard data that a catheter ablation doesn’t just feel good but lets us live a healthier, longer life. CASTLE-AF stands for Catheter Ablation versus Standard conventional Treatment in patients with LEft ventricular dysfunction and Atrial Fibrillation. At the 2018 AF Symposium, Dr. Nassir Marrouche presented results of the full CASTLE-AF study. (I reported briefly on initial findings last October (see CASTLE AF Study: Live Longer―Have a Catheter Ablation). The 9-year, multicenter CASTLE-AF trial started in 2008 and focused on patients with A-Fib and systolic heart failure. The 398 participants were at 31 sites in 9 countries across Europe, Australia and the U.S.
Study participants had A-Fib and advanced heart failure (i.e. low ejection fraction less than 35%) and were randomized to receive either radiofrequency catheter ablation or conventional drug treatment. The median follow-up period was 37.8 months. ▪ Catheter ablation lowered the death rate by 47% vs conventional drug therapy..
▪ Even though 94% of the patients were taking Coumadin, the catheter ablation group’s stroke rate was ½ of the conventional drug treatment group. The voluntary HONcode accreditation program sets out a standardized criterion of eight principles of good practice for health information websites. Each applicant is checked for compliance by a review committee including medical professionals. Our HON seal is displayed in the footer of our web page and is directly linked to the A-Fib.com HONcode certificate located on the HON website. When visiting other health-related websites, look for the HON Code of Conduct badge to be assured of the site’s quality and trustworthiness of medical and health online information. Websites change every day. So it’s no surprise when reader Debbie L. emailed us about a non-working link. Thanks to her alert, I’ve updated my links to print your own emergency medical ID wallet cards. • American Red Cross Emergency Contact Card link on PDFfiller.com site or go directly to PDF form. Use the PDF form to enter your information. Then, print, trim, fold and add to your wallet or purse. Or print the blank form and fill-in by hand. • If you choose a medic alert bracelet with limited space, add the message “See wallet card,” and carry a wallet card with all your medical details. Whichever method(s) you use to carry your emergency medical information, don’t forget to review and update the contents regularly especially when you change doctors, or start (or stop) medications or have a medical procedure. Knowing you have up-to-date medical information gives you a little bit more peace of mind. For more about how to carry all your medical information in case of emergency, see our article: Your Portable Medical Information Kit. ‘Silent A-Fib’ is a serious public health problem; 30%-50% of those with ‘silent’ Atrial Fibrillation don’t know it. They may get used to their symptoms or they write off the tiredness, dizziness or mental slowness to growing older, but their heart health may be deteriorating; Untreated, about 35% will suffer a stroke (half of all A-Fib-related strokes are major and disabling). To inform the public about this healthcare issue, A-Fib.com offers an educational infographic and awareness posters. See the full infographic. To help spread awareness, Share it, Pin it, Download it. See the posters here. Summertime Fun! 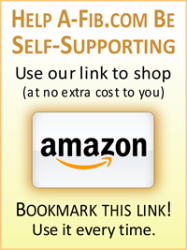 Shop Amazon.com & Support A-Fib.com Too! It’s the time of year for vacations and family activities with your kids or grand-kids. When you shop for your summer events, did you know your purchases can support A-Fib.com? How? Just shop online at Amazon.com using the A-Fib.com Amazon portal link (this link automatically credits us, you don’t have to do anything else). Bookmark this Link—Use it every time! Your purchases generate a small commission for A-Fib.com—at no extra cost to you. We apply those proceeds toward the monthly costs of publishing this website. A-Fib.com is a 501(c)(3) nonprofit organization. 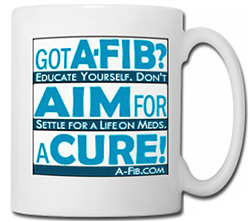 Our goal is to make A-Fib.com a financially self-sustaining site AND maintain our “no advertising” policy. Many sites are funded through third-party advertising like Google ads. You’ll find none of those ads breaking up our articles or crowding our webpages. 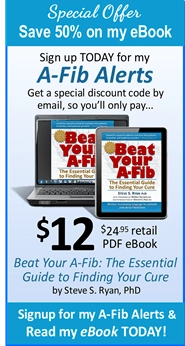 So help support A-Fib.com—use the A-Fib.com Amazon portal link every time you shop online. We appreciate your support. Some individuals are clearly more susceptible to developing Atrial Fibrillation than others (likely due to genetic variations in cell functions). Recent studies suggest that up to 30 percent of all people with atrial fibrillation may have a history of the condition in their family. Researchers are working to determine which genetic changes may influence the risk of atrial fibrillation. 1- Understanding A-Fib: Genetics, Will my children get A-Fib too? 2- Inherited A-Fib? Is it More Risky for Family Members? 3- FAQs: Can I Prevent Familial A-Fib with Diet? Supplements? Read about others with A-Fib that runs in their family. Go to A-Fib Patient Stories: Listed by Subject, and look for Causes, then Genetics/Heredity. Click on the number of any story and that page will open for you to read. We also extend our congratulates to our friends who also made the list: Travis Van Slooten (Living with Atrial Fibrillation) Dr. John Mandrola (Dr. John M) and Mellanie True Hills (StopAFib.org). 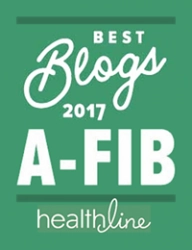 Visit the Healthline The 2017 Best A-Fib Blogs to review all the winners. We’ve updated and expanded our page of Steve’s recommendations for A-Fib-related products. Steve’s shopping guides help you sort through the vast array of products of interest to A-Fib patients and their families. These brands and products are available from many online and other retailers. We invite you to read more about the following shopping guides: Go to Steve’s Steve’s Shopping Guides to Recommended A-Fib-Related Products. 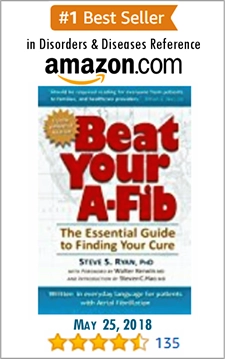 Use our Amazon.com portal link and support A-Fib.com at the same time (at no extra cost to you). Shop for anything, and your purchases generate a small commission which we apply to the maintenance costs of this website. Bookmark this link. Our friend, Travis Van Slooten, over at Livingwithatrialfibrillation.com has written a comprehensive post about saving money on your prescription medications and why U.S. readers should consider buying online from Canada. Why? He sums it up in one word, cheap! Best online price for Eliquis in U.S. The same prescription drugs that you buy in the U.S. can be ordered for a fraction of the cost online from a Canadian pharmacy. As an example, Travis comparison shops the price of a 30-day supply of the anticoagulant Eliquis which retails for $484.40 in the U.S. The best U.S. price he found online was $404.87. Read along as he shops at Canadian pharmacies (Canada Drugs, CanadaDrugPharmacy.com and YouDrugStore.com). VIDEO: The post culminates with a 12 min. video as Travis places his Eliquis order at YouDrugStore. com for $129.99. Is It Legit & Legal to Buy Prescriptions Online from Canada? Well, the answer is yes! It is legit and it is legal. It is perfectly legal for a U.S. citizen to purchase prescription drugs from Canada. And it’s perfectly legal for Canadian pharmacies to sell U.S. citizens prescription drugs. Watch the video and you’ll see that everything is on the “up and up” and how seamless and painless the process is. For all the details on how this works, read Travis’ detailed review at How To Buy Cheap Prescription Drugs Online. A-Fib Inc. has earned GuideStar’s highest rating, the GuideStar Exchange Platinum Seal, a leading symbol of transparency and accountability in the non-profit world. In order for A-Fib, Inc. to earn the GuideStar Exchange Platinum Seal, we filled in all required and optional sections of the report pages for Bronze, Silver and Gold levels and uploaded requested and additional documents to our profile on www.guidestar.org, including our annual financial report, 990 IRS filings, corporate officers, incorporation documents, etc. A-Fib.com was first rated by GuideStar in 2014. Our GuideStar seal is displayed at the bottom of every A-Fib.com page. 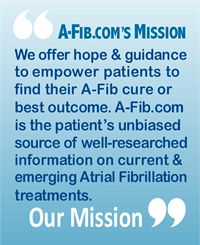 To learn more about us, visit our A-Fib, Inc.’s GuideStar Profile. About GuideStar USA, Inc.: GuideStar is the world’s largest source of information on nonprofit organizations and allows nonprofits to supplement the public information that is available from the IRS. I have written about how aspirin is no longer recommended as first-line therapy to prevent A-Fib stroke. (See my Update: Aspirin No Longer Recommended as First-Line Therapy for Stroke Prevention.). But it’s not just A-Fib patients who shouldn’t be on aspirin therapy for stroke prevention. Data indicates more than 1 in 10 adults take aspirin when they shouldn’t. Warn your family and friends who are taking daily aspirin: Maybe they shouldn’t be. The problem with routinely taking aspirin, acetylsalicylic acid (ASA), is an increased risk of bleeding complications. More than one-third of all adults in the U.S. are now taking aspirin for primary and secondary prevention of cardiovascular disease (CVD). “Primary” means preventing a first event like a heart attack. “Secondary” means preventing a reoccurrence of an event, like a second stroke. As a “primary” prevention, only patients with a moderate to high 10-year risk of cardiovascular disease and stroke should be on aspirin therapy (estimated using the ACC/AHA risk-prediction calculator or similar calculator). Aspirin is recommended for “secondary” prevention. If you’ve had a stroke, aspirin IS appropriate as a means of preventing a re-occurrence or ‘secondary’ event. Aspirin is not appropriate for adults who are at low risk of cardiovascular disease—defined by their 10-year stroke risk score. For these adults, the risks of gastrointestinal bleeding and hemorrhagic strokes outweigh any potential benefit. “Among the more than 16,000 deaths each year linked to bleeding… about one-third of these deaths occur in those who take low-dose (81-mg) aspirin.” The 2014 an FDA statement warned against widespread use of aspirin in adults of average risk. It’s all too easy to take an aspirin―we don’t need a prescription to get it. But taking an aspirin isn’t like taking a vitamin. Aspirin, acetylsalicylic acid (ASA), is a pharmaceutical drug. Caution: Suddenly stopping daily aspirin therapy could have a rebound effect that may trigger a blood clot. It’s important to talk to your doctor before making any changes. A “failed” heart is NOT one that has suddenly stopped. Instead, it occurs when the heart is unable to pump enough blood to the other organs to satisfy their need for oxygen and nutrients. It usually manifests as tiredness and weakness, breathlessness and swelling of the legs and abdomen. The force or strength of the atrial contraction (which forces blood into the ventricles). Check it out. Bookmark it! Refer to it often! The A-Fib.com Glossary of Medical Terms and Phrases is the most complete online glossary devoted exclusively to Atrial Fibrillation. Each definition is written in everyday language—a great resource for patients and their families. (See Glossary of Terms in the left menu.) If you don’t find the term you are looking for—email us and we’ll add it to our Glossary. Once again, A-Fib.com has earned the Health On the Net Foundation (HON) Certification for quality and trustworthiness of medical and health online information. When browsing healthcare sites on the web, look for the HON Code certificate. Learn more at Health On the Net Foundation (HON) Certification. Update March 24: The Cleveland Clinic has given us permission to host this graphic on A-Fib.com for the viewing and printing by our readers. Print and keep this illustration handy for the next time you talk with your doctor about the workings of your heart. You can make notes directly on the picture. Download the PDF file and store on your hard-drive. To have one handy when you need it, print and store copies in your “A-Fib Binder or folder“. Video: You may also want to watch the video, How Your Heart Works and Understanding Arrhythmias, or one of several heart animations from our A-Fib.com Video & Animations Library. Also see our Free Offers and Downloads page. New FAQ: Do Ablations Only Treat A-Fib Symptoms and Not a “Cure”? My answer: A successful catheter ablation doesn’t just treat A-Fib symptoms, it physically changes your heart. Isolates PVs: An ablation closes off the openings around your pulmonary veins (PVs) so A-Fib signals from the Pulmonary Veins (PVs) can no longer get into your heart. It electrically ‘isolates’ your PVs, and if successful and permanent, you should be protected from developing A-Fib that originates from your PVs (where most A-Fib originates). Recurrence Rates: Older research showed that recurrence of A-Fib after an ablation occurred at a 7% rate out to five years. But this was before the use of the newer techniques of Contact Force Sensing catheters and CryoBalloon ablation which make more permanent lesion lines around your Pulmonary Veins. I’m in Orlando, FL, for several days attending the AF Symposium 2017. Look for my reports and brief summaries in the coming weeks and months.